Lots of sites offer different gambling information for players who just start to play at casinos and also for players who have experience on gambling. It is extremely important to find a place that covers all of the gambling info that is interesting for you. As you probably know to make the choice of the best casino that stands for the gambling law is one of the hardest and good gambling guide can help you with that. Follow us and you will not only learn how to play but will also learn how to win at the best online games like online slots and blackjack, you will get to know all strategies and gambling tips that can make your game successful and of course, with the help of gambling guides you can make your knowledge about poker online better. Texas Hold'em Poker is featured in all land-based and online casino halls. This poker game is played with the standard 52 card deck and starts by the betting. Two players to the left of the dealer make blinds (small and big blind bets) and then every player is dealt two pocket cards. The betting round starts from the player next to the big blind bettor. All the players can choose to call, raise or fold. According to the traditional poker rules the round of betting is completed after all the players have contributed equal to the pot. Three community cards are placed face up in the centre of the table. The players check out their hands and the following betting round starts. Now the player options are to check, bet, call, raise or fold. Then the fourth and fifth community cards are dealt and followed by the betting round each. The players reveal their cards and the winner is indicated by the highest hand which, as Texas Hold'em poker rules state, can be created from the hole cards in combination of any of the community cards. In some cases all five community cards make the best hand, in such a case the players who are still in the hand divide the pot. There are two basic types of Omaha poker: Omaha Hihg and Omaha Hi Lo. Omaha High Poker rules are very similar to Texas Hold’em poker rules. The game also starts from placing the blind bets which are the live bets. Then the players are dealt four (!) hole cards each and the betting round occurs. Like in Texas Hold’em poker the flop, turn and river card are dealt and followed by the betting rounds. The players are also offered to call, bet, raise, fold or check. In the showdown the last bettor is the first to show the cards. Then all the players reveal their cards clockwise and the winner is indicated. Unlike Texas Hold’em, Omaha poker rules state that the player must use two of his or her hole cards and only three of the community cards to create the hand. In case of the ties, the pot is split. Omaha Hi Lo poker is played like Omaha High with one exception in poker rules: in the showdown the player with the highest and the player with the lowest hand split the pot. Seven Card Stud Poker is played with the standard 52 card deck and starts from the betting. In this poker variation according to poker rules before the card deal all the players are to make the ante bet to participate in the hand. Then each gambler receives three cards, two of which are dealt face down and one face up. The player who has the lowest face up card must to bring-in equal to the small bet of the half of it. The round of betting occurs. Note: in order to determine the bring-in the ties are broken by the suit of the lowest cards in such order (from highest to lowest): spades, hearts, diamonds and clubs. Then each player is dealt three face up cards that, as poker rules state, are also called the Fourth Street, Fifth Street, Sixth Street. Every exposed card is followed by the betting round which starts from the person with the highest face up cards. In case there is a pair among these cards the betting amount may be raised to the amount of the big bet. The final seventh card is dealt face down. After the last betting round the cards are revealed and the player with the highest five-card hand gets the pot. Again in accordance with the standard poker rules, in case of identical poker hands the pot is split. This poker variation is also quite popular though it is played mostly in home games. The objective of the game is to get the best poker hand after one draw. According to poker rules Five Card Draw Poker is played with blind bets. The players are dealt five hole cards. The first bettor can call, raise or fold. When the betting is over the players can decide what cards they wish to discard and replace by the others. New betting round occurs. At last like in all poker games there is a showdown. As the poker rules say the winner is the player with the best five-card poker hand. In all the poker variations described above the standard poker hand rankings are applied. This is quite different poker variation. Though poker rules of this game are not common but Three Card Poker gained the popularity by the great easiness and fun of playing it. Sometimes Three Card Poker is referred to two games in one. One of these two games is the Ante and Play game, in which the players compete with the dealer for the highest hand. The second game is the Pair Plus game in which the player bet whether they will or will not get the pair or better. The game starts from betting. Each player is free to make Ante or Pair Plus bet as well as both these bets simultaneously. According to Three Card poker rules the players are dealt three cards each. According to Three card poker rules, after the ante bets are made and the players have received their cards they can raise (to wager the same amount on Play) or fold. Then the players’ hands are compared with the dealer’s one. Note: the dealer must have a Queen or better to qualify. If you raise, you then go against the dealer’s hand. The dealer needs at least a queen high to qualify. Below are the possible outcomes and their payoff. If the dealer doesn’t qualify the winner is paid even money. 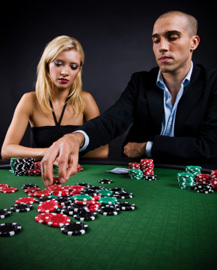 If the player’s hand beats the dealer’s hand both the Ante and Play win 1-to-1. In case of the ties the Ante and Play push (are returned to the player).